Imagine a town where the local TV channel gets more viewers than ESPN. That’s the case in the rural community of Rochester, Indiana (pop. approx. 6,100), where local sporting events, school programs, and town council meetings are the best show in town – and available only on the Rochester Telephone Company’s local origination channel, RTCtv. 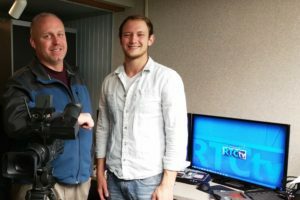 In June two of those students will be hired on fulltime, thus tripling RTCtv’s staff – to a grand total of three. “We’re pulling 120% out of each person.” With that, Sayger is looking to expand coverage even beyond the estimated 1,000 projects he has undertaken in the past year. He was growing his production capacity so quickly that a couple of years ago he realized the operation needed to graduate beyond the jury-rigged PC they were using to play out the old channel. That’s when he called TelVue.